Banana Crumb Muffins. The Nut-Free Version. I've mentioned before that my favorite muffins are banana muffins. I always end up with brown bananas at the end of the week. My kids always eat all but about three on a bunch, and then I'm left with brown bananas sitting on the counter. SO, much to my delight, I get to make banana muffins a lot. Most of the time, I have pecans on hand, so I make my favorite recipe for Banana Nut Crumb Muffins. But, I didn't have pecans yesterday, so I decided to play around and see if I could make these muffins taste just as good without nuts. The last time I tried, they were missing something. These turned out perfectly. Many of you have commented that you don't really like nuts in your baked goods, or you have children in the house that can't eat them, so this version is perfect for you. I added sour cream to this version, and added one extra banana. The sour cream gave the muffins that bit of savory-ness that they needed without the nut flavor, and the extra banana made them a bit more stable (muffin-like instead of cake-like). I also made these into jumbo muffins, using the muffin cups I use when making my Jumbo Blueberry Sour Cream Muffins. This banana muffin recipe makes 8 jumbo, or 12 regular-sized muffins. My husband - the nut-hater in our house - went crazy over these. So, I'll be making them all the time. After all, his smile is one of the main reasons I cook at all! Preheat oven to 375 degrees. Lightly grease 12 muffin cups, or line with muffin papers. In a large bowl, mix together 1 1/2 cups flour, baking soda, baking powder, salt, and cinnamon. In another bowl, beat together bananas, sugar, egg, sour cream, and melted butter. Stir the banana mixture into the flour mixture just until moistened. Spoon batter into prepared muffin cups. In a small bowl, mix together brown sugar, 2 tablespoons flour, 1/4 teaspoon salt, and cinnamon. Cut in 1 tablespoon butter until mixture resembles coarse cornmeal. Sprinkle topping over muffins. *These muffins freeze perfectly. Just pop any uneaten muffins into the freezer, and microwave for 30 seconds when ready to eat. I have some brown bananas in my kitchen right now, so these muffins would be great! You mentioned sour cream, but I don't see it listed in the recipe. Thanks so much for letting me know about the sour cream - I fixed it! Banana muffins are my favorite too! So excited for this version! Your recipe sounds delicious. I have bananas setting out right now for baking. yea!! thanks for a nut-free version! with allergies, you never know whether a recipe will be fine with just eliminating the nuts, or whether the nuts make the original recipe. I love banana muffins, but nuts are a no-no at our place. Uneaten muffins in the freezer? Are there ever any uneaten muffins? Not here! Can't wait to make them! Stir in 1/2 cup pecans. I laughed out loud. I know you weren't trying to be funny--but it just struck me. Cinnamon is also omitted in the written recipe. I am making these right now--that's the only reason I noticed. Great blog, an everyday read! God bless. Oh my goodness. I'm gonna have to hire a proofreader for my recipes until I have this baby! Or enlist the Hubs. One or the other. Thank you all for being so patient with my pregnancy brain these days! Oh my goodness those look amazing! If Lily weren't allergic to bananas they would be tomorrows breakfast! i am making these this weekend. i finally have enough bananas left to make them. I just took these puppies out of the oven, and devoured one! So delicious!!!!!! This was an awesome recipe! Made it for my hubby & my daughter and we ended up 5 in one night :) NEXT time I will have to double this recipe! Still yummy! Thanks for sharing! 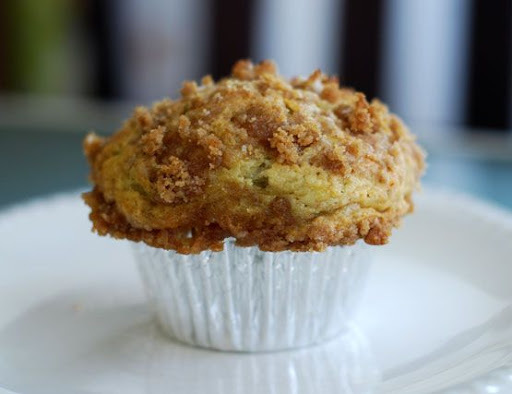 I've been on a muffin kick lately, so I'll definitely be trying these! These are the best banana muffins. They come out perfectly every time and they are a big hit when I bring them in to work. Best banana muffins I've ever made. They got stellar reviews from my family. Super banana flavor and the streusel on top is the perfect addition. So moist and flavorful. Top notch. A+++ thanks for the recipe!